Redness of the skin is very common and can be identified by the occurrence of spontaneous patches of red on the skin. There is no single cause for redness of the skin and there are many factors that play a role in it appearing on the skin’s surface. One probable cause of redness of the skin is Rosacea, a chronic disease that sees inflammation in the cheeks, nose, forehead and chin. 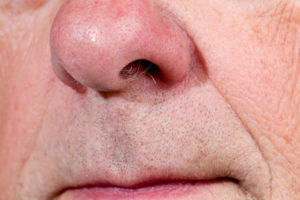 Rosacea occurs when the blood vessels within the skin enlarged. Red blotchy skin can also occur due to contact Dermatitis which is an allergic reaction to substances such as cleaning products, make up products or even rough fabrics that a person may be wearing. Both men and women can suffer from redness of the skin. To avoid the unwanted occurrence of redness of the skin, it is wise to stay away from any triggers that you may have identified.